The Louis Sullivan Building of Newark is a historical and architectural treasure, located on the Square in downtown. Built in 1914 by noted Chicago architect, Louis Sullivan, the building was originally known as the Home Association Bank. The building features ornate terra cotta slabs with intricate mosaic designs and signature lion heads. Over the years, the building has been home to Sanitary Meat Market, Symon’s Best Jewelry Company, the Mutual Federal Savings and Loan Association and most recently, Tiffany’s Ice Cream Parlor. In 1973, the building was added to the National Register of Historic Places. In 2013, the building was donated to the Licking County Foundation by Stephen Jones. Soon after, planning for the preservation and restoration of the Louis Sullivan Building began. The Sullivan Building project has captured the attention of many people in our community, including Denison University cinema professor Dave Bussan. When he got wind of the upcoming restoration, he connected with the Foundation and is partnering to have Denison students film and capture the process in a documentary. 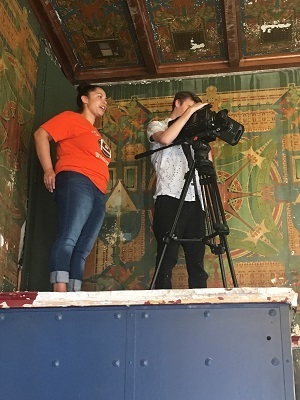 To film pre-construction shots this summer, he enlisted the help of two recent Denison cinema program graduates–Logan Floyd and Kirstie Rodden. “We’re both newly graduated from the Denison cinema program and our film professor is very active in the area and is into documentary filmmaking and asked us to help him document the space as it changes,” said Floyd. Although both students had seen the Sullivan Building before, neither of them had ever been inside nor paid much attention to it. To kick start the documentary, Logan and Kirstie spent an afternoon filming pre-construction shots of the Sullivan Building. During this time, they captured the intricate details of the first floor, second floor and basement and became more acquainted with the building. Exposure to the marvelous architecture and murals has fostered a new appreciation of the building in the students. “The detail to the millwork is something that you don’t see often. The glass on the upper level is something you don’t see every day. It’s very beautiful,” said Floyd. This documentary will act as a creative way of capturing the before and after progress of the restoration of the Sullivan Building. After they finish helping Professor Bussan for the summer, both Logan and Kirstie are moving to pursue careers in filmmaking. Logan is headed to New York, while Kirstie is headed to Los Angeles. Be sure to be on the lookout for the finished documentary when the Sullivan restoration is complete!